This collection of primary sources opens a window into the fascinating and largely unknown early history of the women's Relief Society of The Church of Jesus Christ of Latter-day Saints. 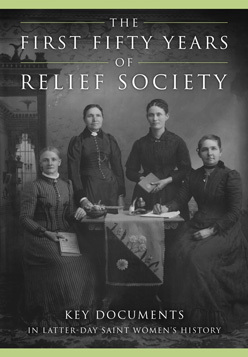 Published in 2016, the volume provides an authoritative history of the first fifty years of the Relief Society through transcripts of seventy-eight key documents, accompanied by introductions, annotation, and hundreds of biographical sketches. Jill Mulvay Derr is a retired senior research historian for the Church History Department, The Church of Jesus Christ of Latter-day Saints. Carol Cornwall Madsen is a professor emerita of history at Brigham Young University. Kate Holbrook is a specialist in women’s history for the Church History Department. Matthew J. Grow is the director of publications for the Church History Department. This collection of original documents explores the largely unknown nineteenth-century history of the Relief Society, the women’s organization of The Church of Jesus Christ of Latter-day Saints. Founded in 1842 in Nauvoo, Illinois, the Relief Society was initially led by Emma Smith, wife of church president Joseph Smith. The substantial minutes of the organization’s proceedings from 1842 to 1844, published unabridged herein for the first time in print, document the women’s priorities, contributions, and teachings. The Nauvoo Relief Society Minute Book also contains six sermons Joseph Smith delivered to the society, the only recorded words he directed exclusively to the women of the church. Prominent in the documents are the towering figures of Latter-day Saint women’s history from this period—Emma Smith, Eliza R. Snow, Sarah M. Kimball, Mary Isabella Horne, Emmeline B. Wells, Zina D. H. Young, and many others. In addition, some two thousand lesser-known Latter-day Saints appear in these records. Each document is meticulously transcribed and placed in historical context with an introduction and annotation. Taken together, the accounts featured here allow readers to study this founding period in Latter-day Saint women’s history and to situate it within broader themes in nineteenth-century American religious history.